PA chairman blasts US peace initiative, says Palestinian people are facing a "provocation" that has been ongoing since Balfour Declaration. 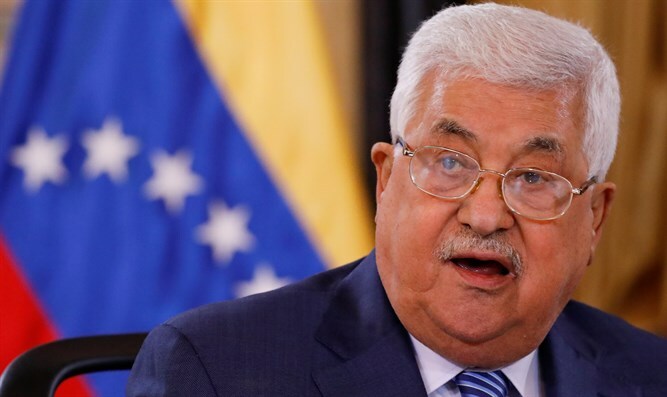 Palestinian Authority (PA) chairman Mahmoud Abbas on Saturday night once again criticized the peace initiative being promoted by US President Donald Trump. "The ‘Deal of the Century’ will not pass and the fate of the land of Palestine will be decided by the Palestinian people," said Abbas in a speech marking 14 years since the death of former PA chairman Yasser Arafat. His remarks were quoted by Channel 10 News. "We are remaining on our land and we will continue to act. Our flag will continue to be raised on the walls of Jerusalem as you always wanted," he said, speaking to Arafat. "The stage that the Palestinian people are going through is one of the most dangerous that has passed so far - the provocation that began with the Balfour Declaration has not yet ended. The occupation must end. You will not find one Palestinian who is willing to renounce the rights of the Palestinian people." His remarks come days after Jason Greenblatt, the US Representative for International Negotiations, visited Israel and met with Prime Minister Binyamin Netanyahu. According to reports on Saturday, Greenblatt said at a closed-door event in London several days after the meeting with Netanyahu that the US will “soon” announce the peace plan. Abbas has rejected US attempts to restart peace talks with Israel and has been boycotting the US ever since Trump’s recognition of Jerusalem as Israel’s capital last December. In his remarks on Saturday, the PA chairman also discussed the Egyptian-mediated contacts between Israel and Hamas aimed at achieving a ceasefire in Gaza. "The attempts to separate Gaza from the homeland will not succeed. We are grateful for the efforts of the Egyptians to implement the ceasefire agreement f 2017," he said. The comments followed a report in the Lebanese Al Akhbar newspaper claiming that Israel and Qatar are hammering out a deal that would allow Hamas to operate a sea crossing between Gaza and Cyprus. As part of the emerging ceasefire, Gaza's civil servants on Friday received their first paycheck in months in a payout funded by Qatar. The cash was delivered into Israeli territory from Jordan, through the Allenby Bridge, and then relayed into Gaza through the Erez Crossing. Israel is closely monitoring how the money is spent, as there is concern in Israel that the Qatari money will be spent on the upkeep of Hamas's terror array.